FAQ: How to profile in my scenario? Reachability scopes distribute objects according to how/whether they are reachable from GC roots. This information is helpful when analyzing the profiled application's memory consumption and searching for memory leaks. Also it helps examining excessive garbage allocation, especially if the snapshot doesn't contain recorded object allocation information. 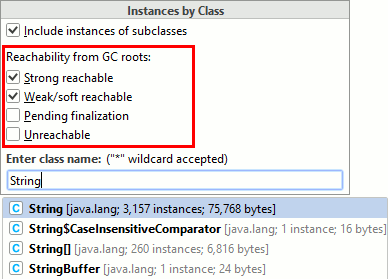 Strong reachable: objects reachable from GC roots via at least one strong reference, or being GC roots themselves. Such objects will not be garbage collected until all strong references to them are nulled and/or they remain GC roots. Thus, memory leaks should be searched among them. Weak/soft reachable: objects reachable from GC roots via weak and/or soft references only. Such objects can be deleted by garbage collector when it decides to free some memory. Such objects are not memory leaks, but they may deserve attention when you analyze memory consumption. Dead objects: unreachable from GC roots, but not yet collected. Once garbage collector decides to delete them, they will be deleted. Objects of classes overriding Object.finalize() will be placed to the finalizer queue before actual deletion. Objects pending finalization: objects in the finalizer queue.